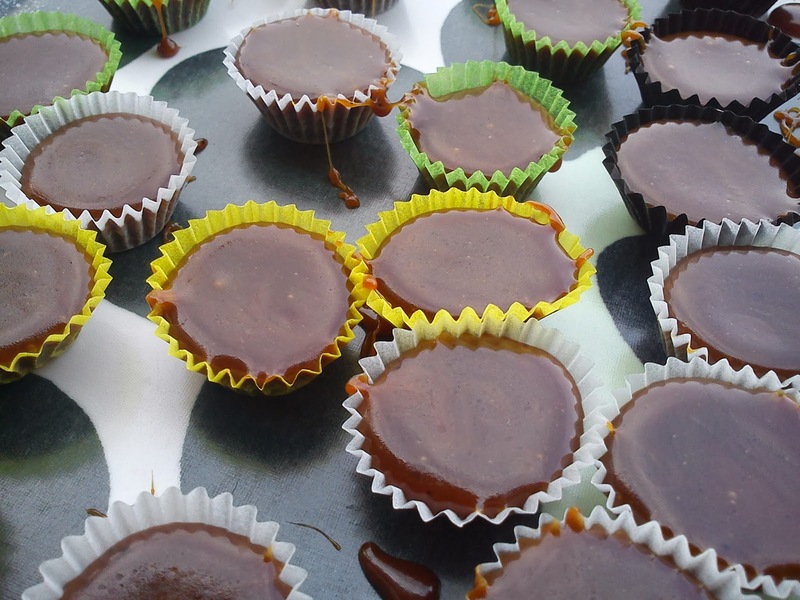 After I cracked the code of making cream caramels, which are not having a fluid structure (Valentine Day Cream Caramel) and I noticed how fast these caramels disappeared into mouth, I have been thinking about making liquorice cream caramels. Therefore I have been on a small sight-seeing tour on the Internet looking at various recipes on liquorice caramels. Here I noticed, that the level of liquorice in my opinion was on the low side. I mean, as liquorice is part of the name, the taste should have liquorice character !!!! So I ended up with using a combination of sweet liquorice syrup and raw liquorice. Based on feed-back from various tasters, I will see, if I should stick the amount or if it should increased or decreased. I can see the worried mind of my good girl friend in Horsens, as we have different threshold for, when a liquorice is in balance or too dominating. Another thing I need to consider, when making caramels in my little kitchen, is, where is the cat ? It is not a great combination to have a cat running around in the kitchen, when you are working with this very, very warm sticky caramel mass of up to 137'C. 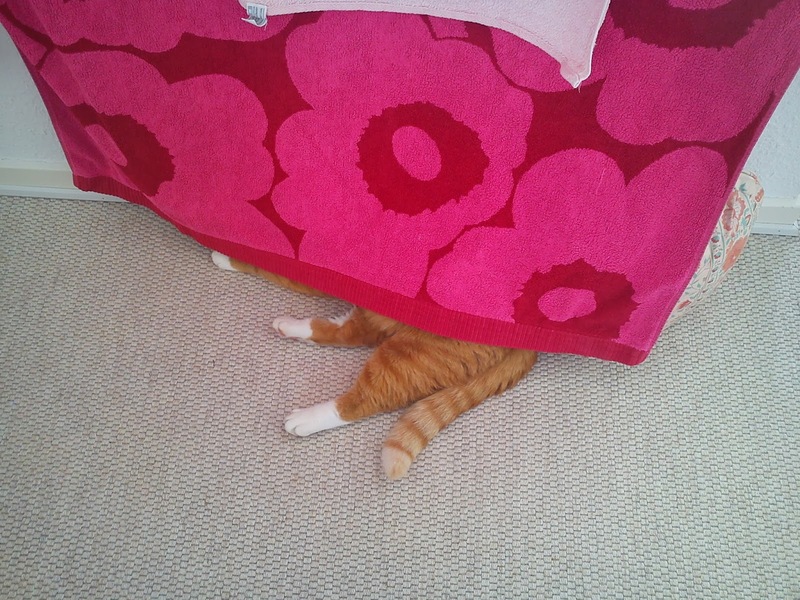 So I need to ensure, that Hannibal the Cat is occupied hunting mice on his hunting area or sound asleep upstairs. Add all the ingredients into a small cooking pot. Stir continues, as the caramel mass is heated up, until the temperature reach 137'C. Fill the caramel mass into small alu- or paper-form. Place the caramels cold, until they cooled down. My very good friends in Horsens suggest, that we should spend a Saturday evening in some good company. Being in the company of good friends enjoying a great meal sounded as an excellent idea for me. 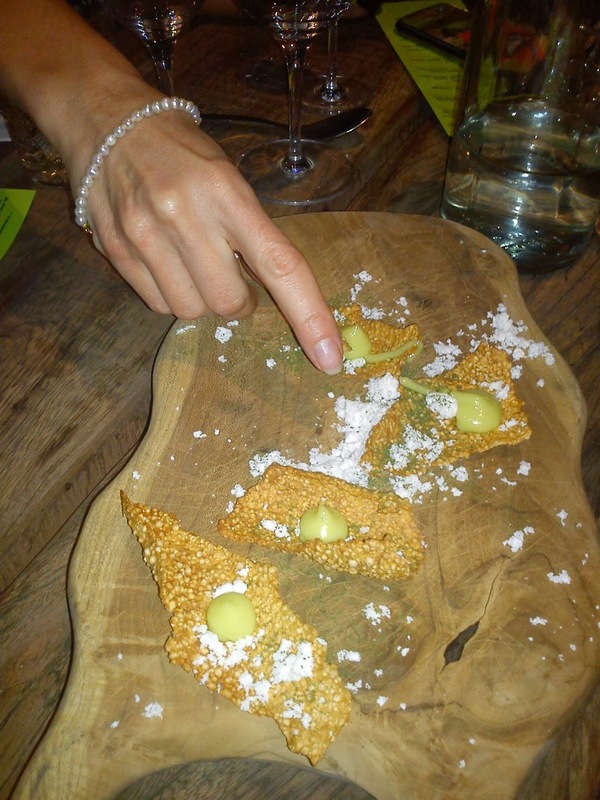 We started off with a snack of crisp cockerel (skin ? ), vinegar dust and creamy dill mayonnaise. I really like the crispness, is what like eating one big potato chips, which tasted of bacon and not chicken ! 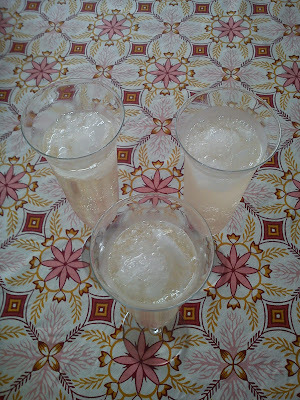 Together with the snack we were served an excellent tasting glass of pink coloured sparkling wine. Excellent combination. 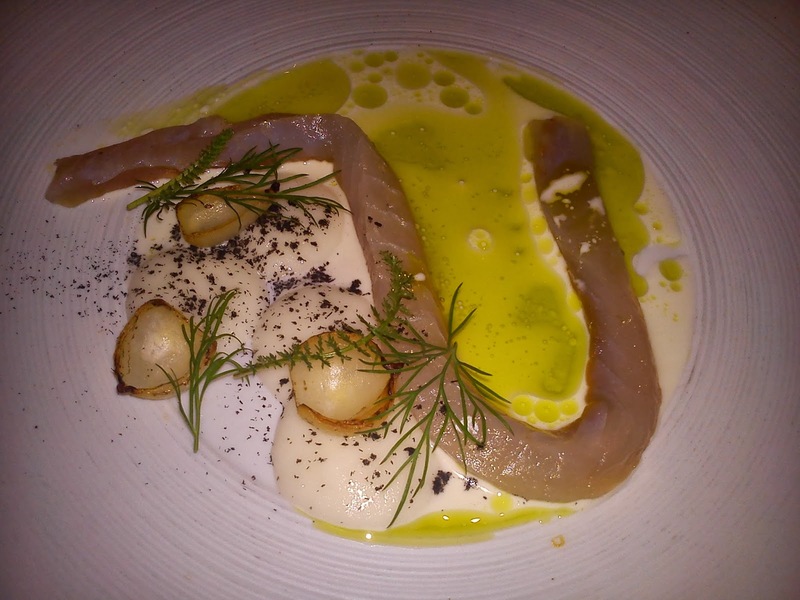 As starter we got a carefully designed plate of rimmed coal fish, onion puree, onion cream, bunt onions, dill oil and herbs. So onions was a carrying theme for this starter with plenty of taste and texture variations. The main course was the favourite meat food of the Danes = pork. 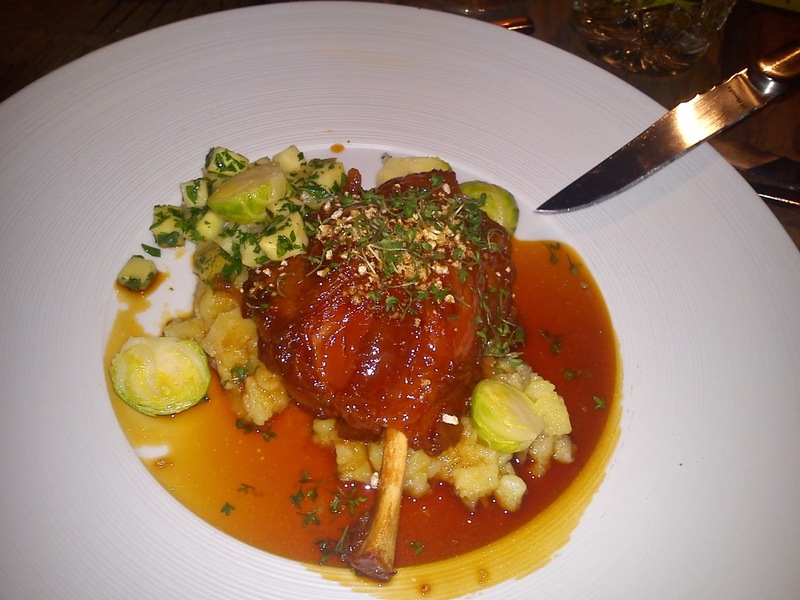 Blown glazed radius (the lower part of the pig leg), puffed pork rinds (which I did not located on my plate), Brussels sprouts and parsnips served a great tasting brown sauce. I think it is the very time, that I have enjoyed radius, which turned to be very tasting. So I will not be afraid to pick this another time on a menu card. 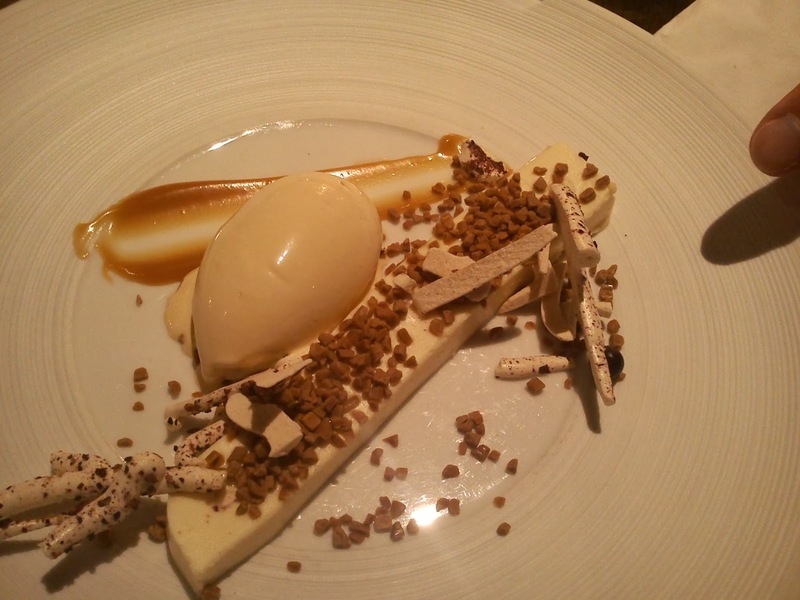 The dessert was themed around caramels in various disguise: caramel ice cream (which was not frozen enough in my opinion), coffee meringue (perfect taste of coffee), panna cotta (very cream with a refreshing taste twist of lemon) and tiny pieces of caramels. A very tasty dot to a great meal. During the entire meal you could and some more glass of wine. You could choose between two white and two red wines, good quality wine, and there was plenty of wine during the entire evening. I really like this all-inclusive concept as both food and wine were of great quality. As mentioned previously I paid 499 DKK (= 66 €) for both food, wine and tea. So it really value for money to participate in this GranDining. And it is not the last time, that I will enjoying GranDining. Hopefully I can find a driver next time, so I really can enjoy wine ad libitum part of the meal !!! One week to go !!! Next Sunday is Shrove Sunday and the keep time for Shrovetide buns. So to celebrate this season of Shrovetide buns I have been on the look out for some new recipes. I decided to use the bun dough from Frøken Annes køkken på fastelavnsboller 2014 with a filling of Speculoos paste from Belgium and to decorate the icing sugar with Speculoos cookie crumble. I find the bun dough to quiet fatty to work with, therefore I rolled in bed of flour = using plenty of flour below and top of the dough, so it would not stick to much to the surface of my kitchen table. I must admit, that this specific recipe on a bun dough is not going to a favourite of mine, when I am baking Shrovetide buns or buns in general. 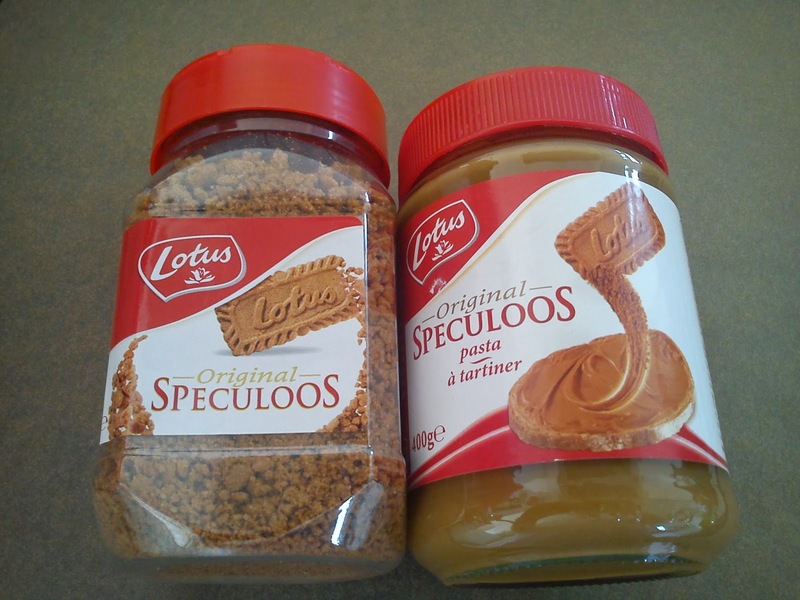 Using Speculoos paste is bringing uniqueness to Shrovetide buns instead of the more traditional cream filling or mixture with marzipan. Add milk, yeast, eggs, sugar, cardamon, salt and butter into the mixing bowl. Let is stand for 30 minutes at room temperature. Add the flour into the mixing bowl. Knead everything together using the dough hook on a kitchen mixer on speed 2 for 2 minutes. Let the dough raise for 30 minutes. Cool down the buns before decoration with sugar icing and Speculoos cookie crumble. During the Winter season you can sometime need a hot and warming meal to keep your warm during some cold and windy Winter days. The dish is an easy meal to cook and prepare including making a bigger portion for some easy meals during busy week days. Fry the beef meat, onion and garlic in the hot olive oil. After frying add into the pepper fruit squares and mushrooms. Fry for another 2 minutes. Add in the canned tomatoes and water. Bring the dish to the boiling point. Add in the starch and maize. 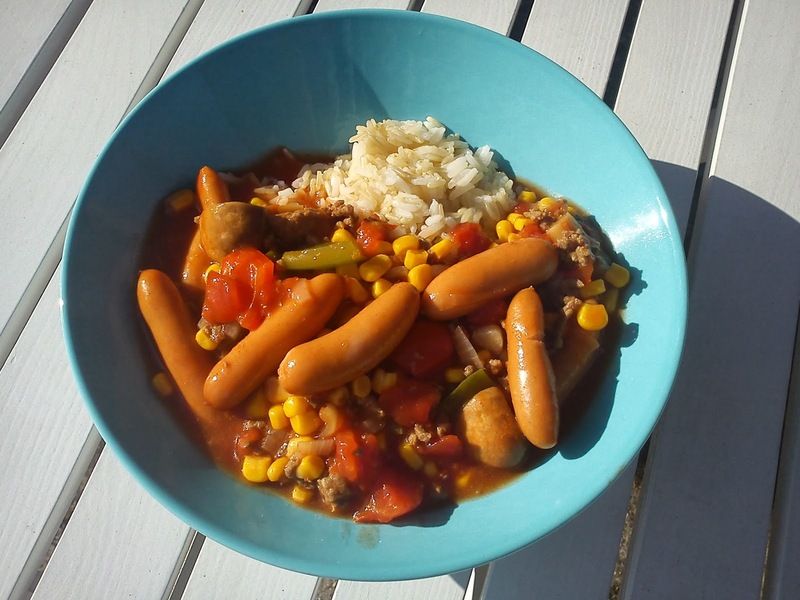 Finally add in the cocktail sausages. Let the entire dish boil gentle for 4 minutes. Serve this Winter Pot with boiled rice. 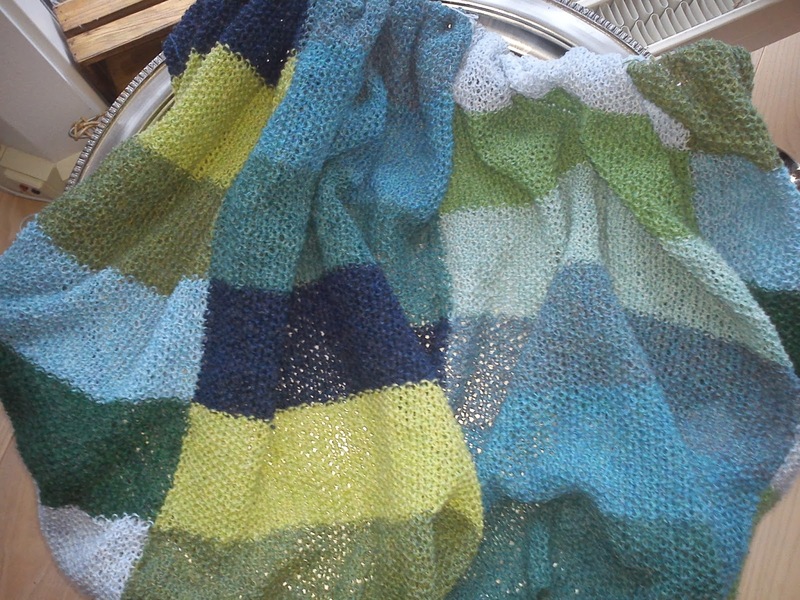 Last Winter I survived some very cold and icy weather with this knitted neck tube safely located around my neck. The brilliant thing about a neck tube is, that you can not loose it like you can loose a scarf being grab by wind. A neck can either keep your neck warm or it can cover both your neck and head, if the wind is too cold for your ears. 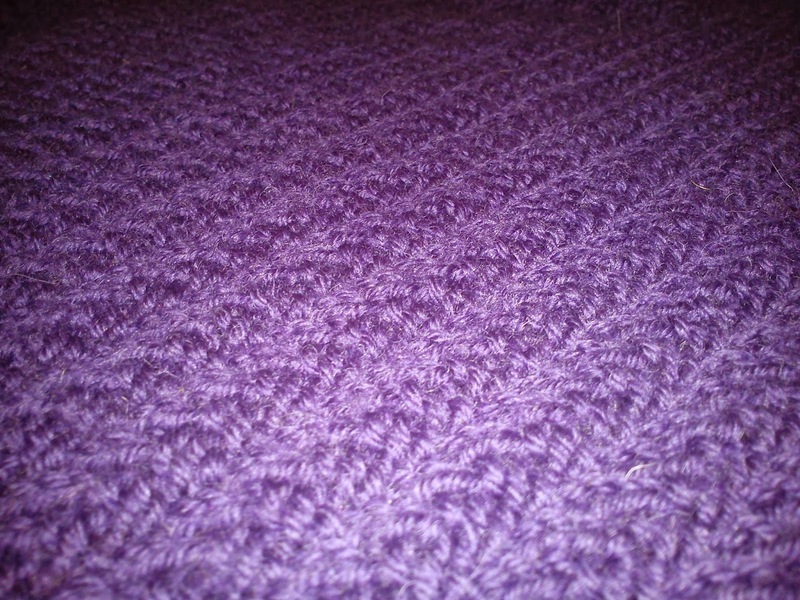 This neck tube is knitted in a relative simple pattern, but it is not fool proof, as the pattern is shifting on every second pin. 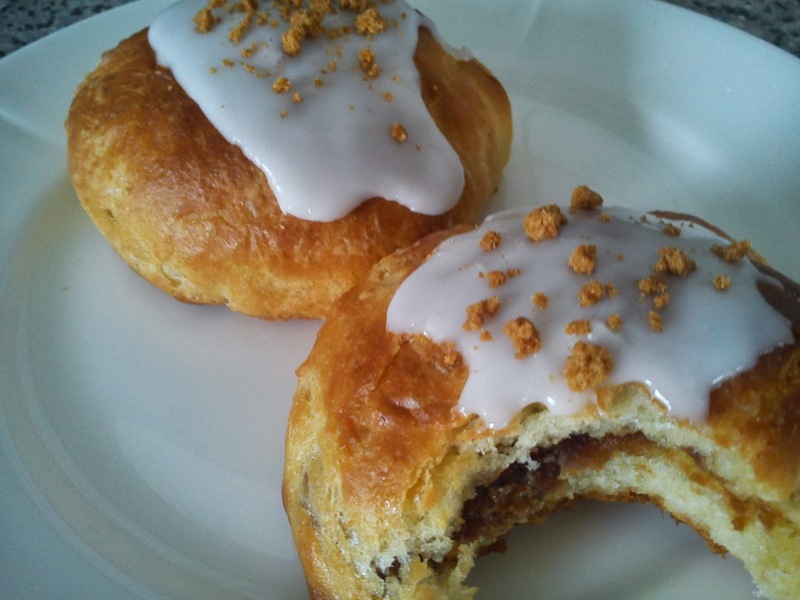 After some search on the Internet, I found the recipe here: Søhestens halsedisse. 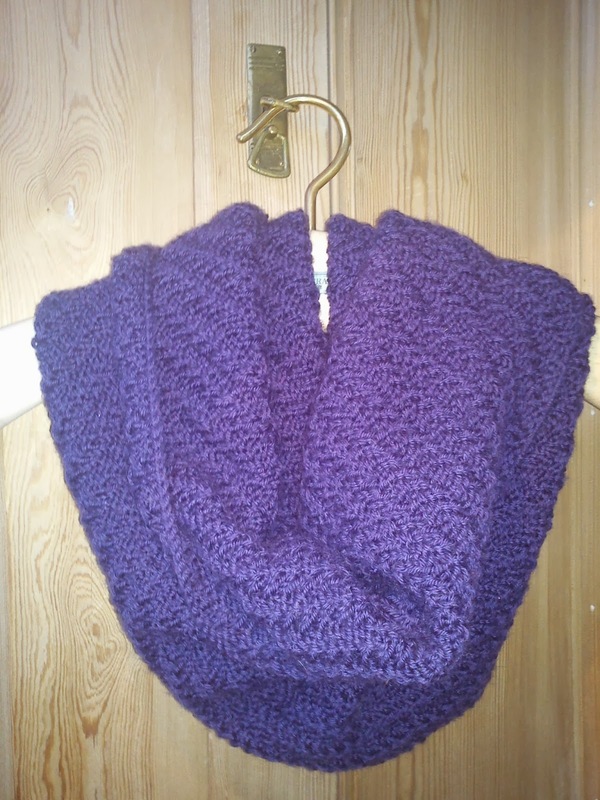 I used some warm, soft 100% wool for my neck tube, which is not scratching my skin. 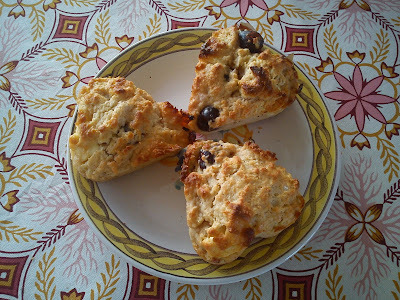 Winter time is season for all types of citrus fruit, so I decided to make some orange scones using this recipe on saffron scones as starting point. These scones had a fantastic taste of orange and buttery texture. Mix the flour, salt, orange zest, baking powder and sugar together in a mixing bowl. Mix the orange juice, orange flower extract, milk and egg together. 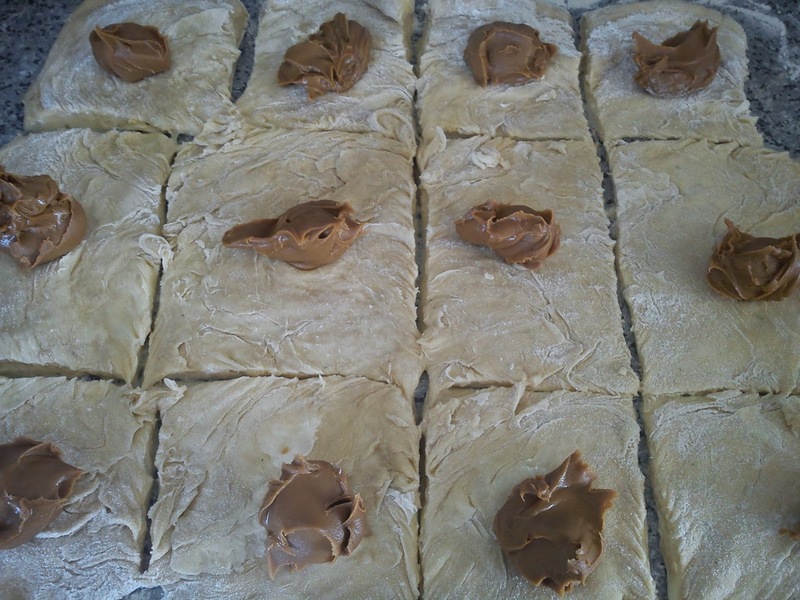 Add the juice-milk and egg without kneading into a dough. Bake the scone at 250'C for 12-15 minutes. In January I went on a business trip to Helsinki, Finland accompanied by a Greenlandic seal and a Russian silver fox to keep me warm during daytime temperature of between -10'C and -15'C. 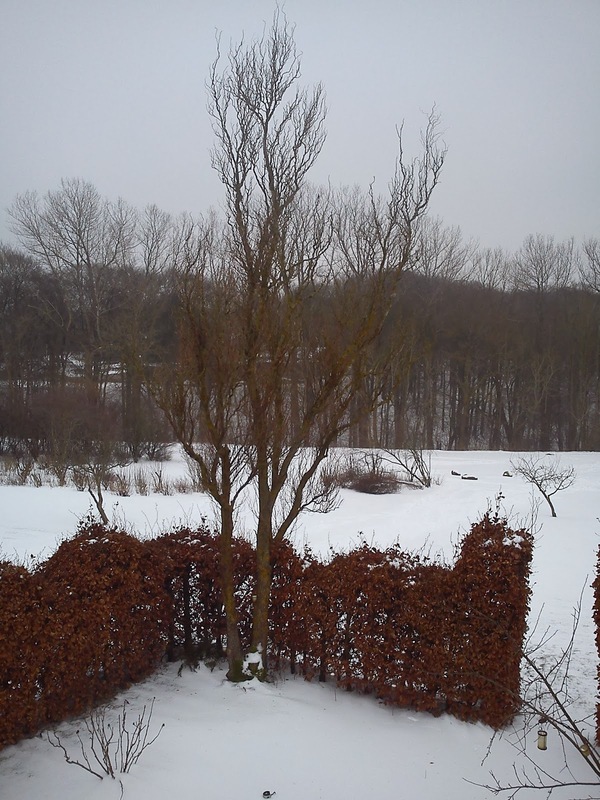 Well, it is not that cold, when it is not windy as it is most of the time here in Denmark, where +4'C due to the wind feels like -10'C. Another good thing about travelling during the Winter period in the Nordic region is, that the traffic neither on land nor in the air is collapsing due to snow, ice or just low temperature !!! One evening I went out to look at some of the wonderful design shops located in Helsinki as well as to find an interesting place to eat instead of at the hotel. And here I passed by Restaurant Aino located in the city centre. Quiet unusual all the guests eating here were females !!! 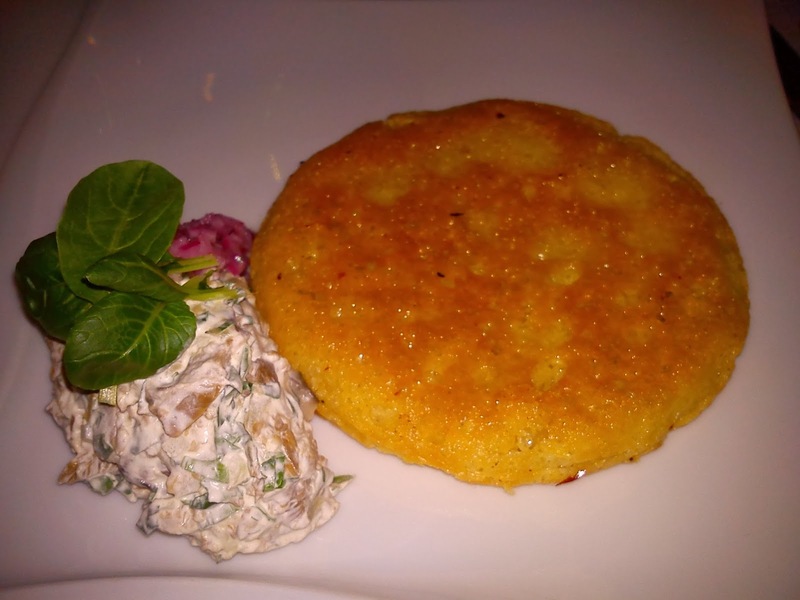 As starter I choose to have blinis served together with mushroom salad and with melted butter poured on top of the blinis. Apparently the season from mid January to beginning of March is referred to a blinis season in Finland, as the very cold Winter weather demands a high calorie intake fitting very well eating blinis served with melted butter. Good size of a nice crispy blinis. As main course I was not in doubt at all, when I eat game, so here I choose reindeer fillet with port wine sauce, potato cake and cep mushrooms. I just love to eat Bambi !!! 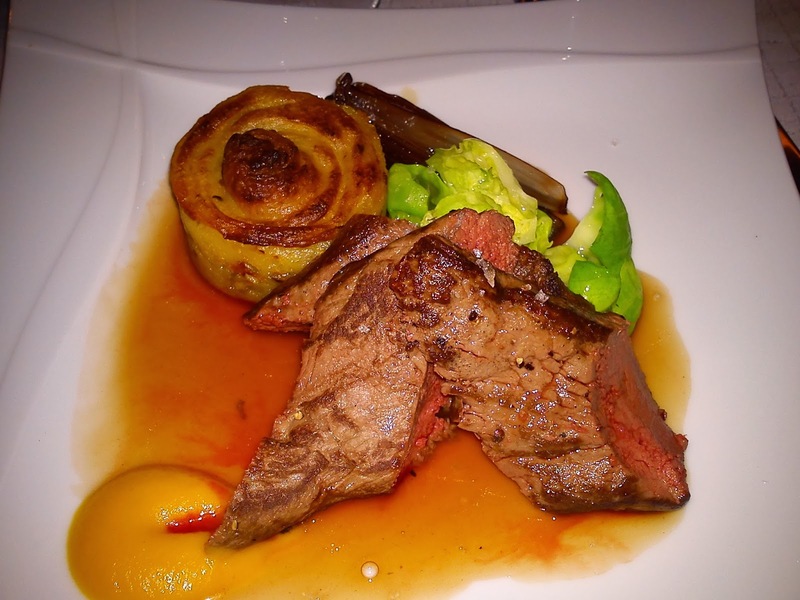 Excellent taste and the texture of the reindeer fillet was so soft, that you could chew with your eye lashes. In total I ended to with paying approx 65 € for food and 1 glass of white wine. I will give this meal 5 stars combined with a return next time I am in Helsinki. 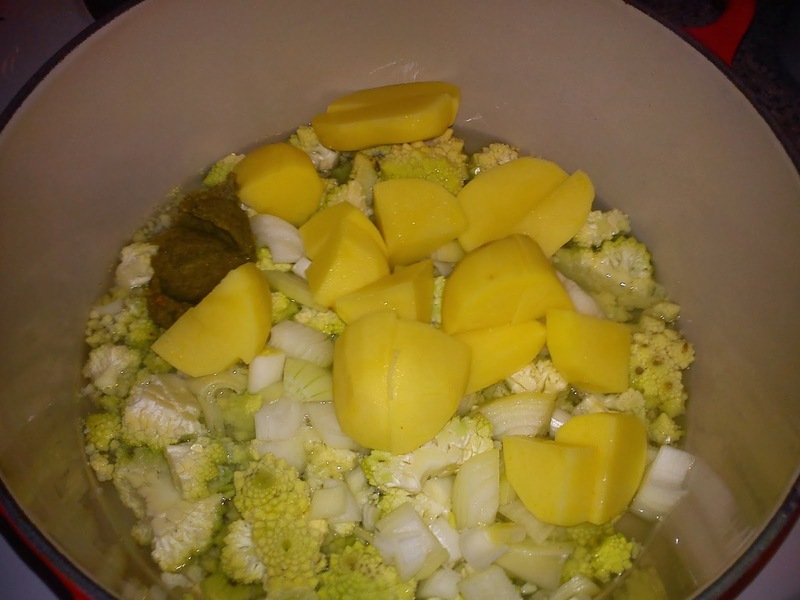 Put all the vegetable into a medium size cooking pot together with 4-5 dl vegetable stock. We are coming to the end of a very romantic and tasteful Valentine Day. We will end this day of love with a spark of champagne in this red sweet yet refreshing cocktail. 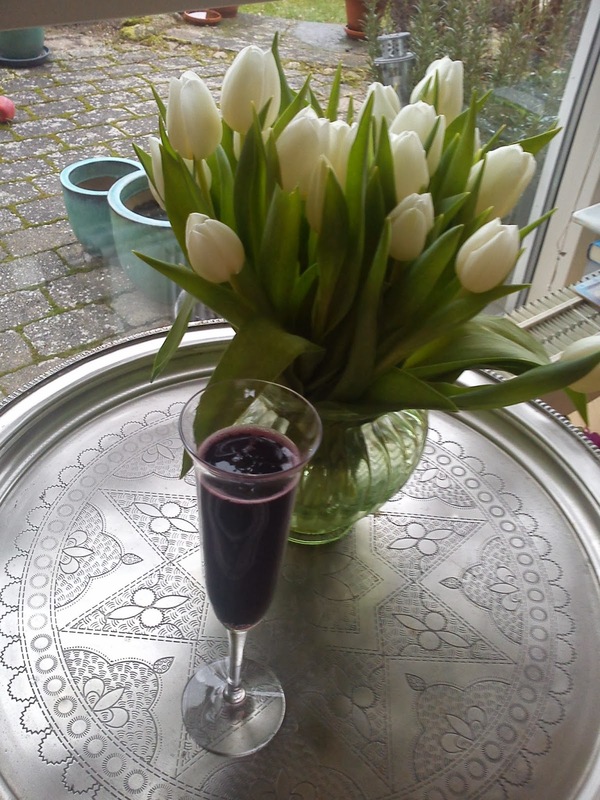 Fill the pomegranate syrup and cherry wine into a champagne glass. 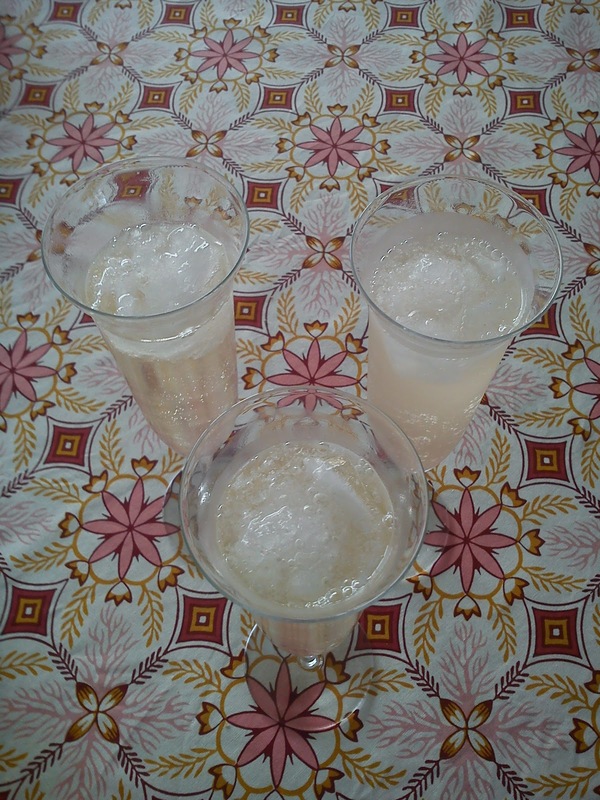 Fill up the rest of the glass with champagne or sparkling wine. Karen from Lavender and Lovage has obviously enough selected chocolate for this romantic Winter month. 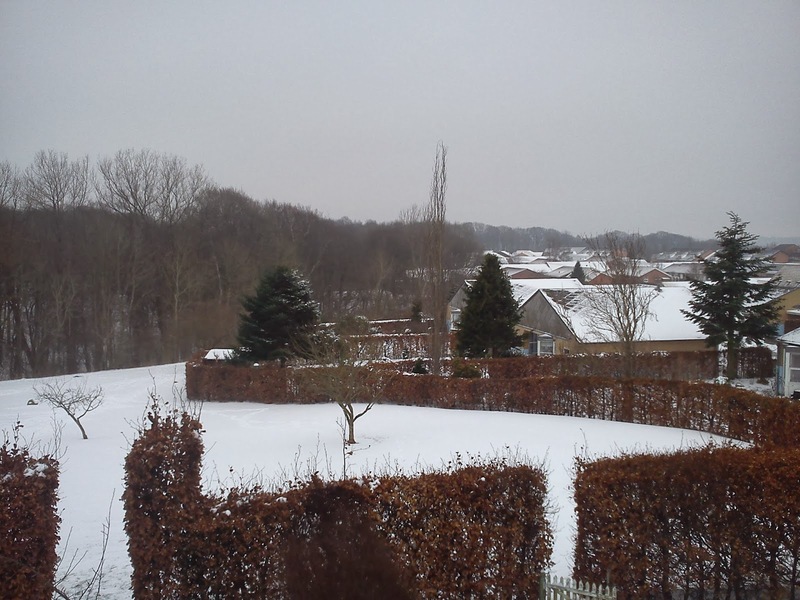 For me Winter should have the colour of white, which is not the case at all living in Denmark !! !, so I decided to use white chocolate in for my contribution for the romantic tea table. The other universal colour of romance/love is red, which in my case is being translated into cherry sauce !!!! allowing me to use some left over Christmas stuff in form of cherry sauce. 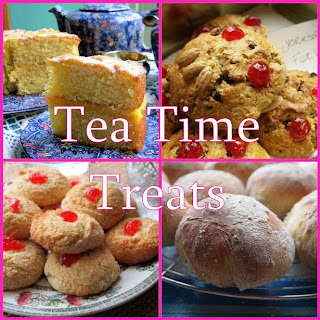 The Tea Time Table is a monthly blogging event managed Karen from Lavender and Lovage and Jane from The Hedge Combers. I decided to use this recipe on Femina´s panna cotta med hvid chokolade as starting point making one important change replacing the entire amount dairy whipping cream with a ratio of 50% milk and 50% dairy whipping cream, as I find using only dairy whipping cream gives a too fatty dessert. Using a mixture of milk and dairy whipping cream also makes it possible to use an electrical beater in connection with adding in the gelatine sheets, ensuring that the gelatine is distributed evenly in the dessert without making these awful gelatine strings, which I remember with horror from my grandmother´s citronfromage (lemon mousse). Using a electrical beater on a panna cotta mix of dairy whipping cream could very easily turn the panna cotta in a cream mousse. As I am having less cream in my version of this panna cotta, the sweetness from the sugar is coming more through, so you could consider either reduce the sugar level with 5-10 g to 50-55 g sugar or use fruit being more fresh than a sweet cherry sauce, if you have less of a sweet tooth. Place the gelatine sheets in a bowl with cold water. Remove the vanilla corns from the pod, shred the corns apart using a little part of the sugar. Pour the milk and cream into a small cooking pot, adding in the sugar, vanilla corn and pod on top. Heat up the cream base, and let it cook gentle for 10 minutes. Put the white chocolate in a small mixing bowl. Slowly pour over the cream base over the white chocolate, while stirring. When the white chocolate is melted, squeeze the gelatine sheets for water, and them into the panna cotta mass. Stir very well to avoid gelatine strings. I use an electrical beater for this purpose. Pour the panna cotta mass in the serving forms. Store cold in the refrigerator for minimum 3-4 hours. 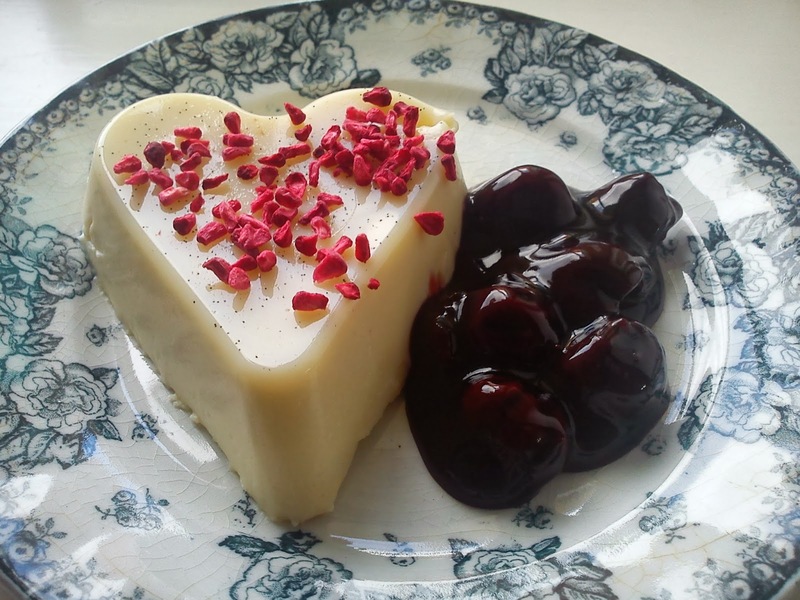 Served the white chocolate panna cotta with cherry sauce. I have found this recipe on these marzipan cakes on Himmelske Kager - kransekage med hindbær og lime. I have made no changes at all to the recipe. However, next time I will make a reduction on the amount of icing sugar, as I find the sweetness level to cover over the taste of raspberry and lime. I imaging a reduction of 20-25 g icing sugar to a total amount of 75-80 g icing sugar would give a more flavour full and less sweet taste. Heat up the (conventional) oven to 200'C. Knead the marzipan, icing sugar, egg white and lime zest together by hand to a homogeneous mass. At the end of the kneading process add in the freeze dried raspberry. Roll the marzipan cake mass into long strings, which is cut into a desired length. Place the marzipan cake on a baking tray covered with baking paper. Bake the marzipan cake in the upper part of the oven at 200'C for 10 minutes. Cool down the marzipan cakes. 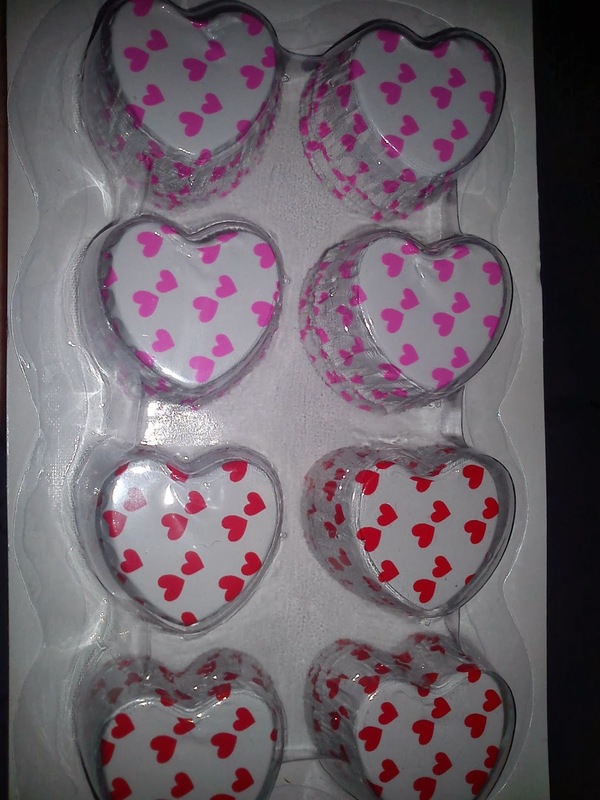 Make some icing for gluing on the heart shape decoration. It is now hours ago, that we started Valentine Day with Sweetheart Yogurt, so I think it is time for a little sweet to get us through to lunch time. Some time ago my blog and I received a bottle of liquid glucose syrup together with various candy recipes. 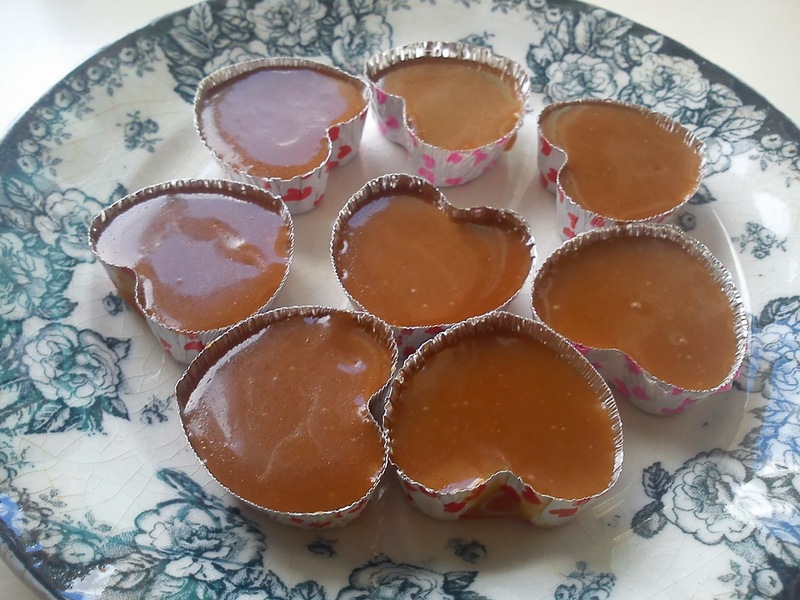 So fare I have been making caramels (toffee) twice using my microwave oven with little success, as the caramels have be floating together. Using glucose syrup is either ice cream or toffee /caramels are prevent crystal growth and graininess according to the information, which I received together with the bottle of glucose syrup. In the various recipes, which I received, I see that the boiling temperature can be between 125'C and 137'C. So fare I have no idea, which influence the boiling temperature is having on the final texture of the caramels. Well, I think I will test this some time and share the outcome with you. And finally I got success with my caramel creation, as they firm/crunchy with an excellent creamy texture and buttery flavour notes. A sweet treat for a sweet person. It is time for you to get up and enjoy this entire day of Romance. And the day starts off with a bowl of Greek yogurt for breakfast, so you have something nutritional in your stomach for all the upcoming sweets of today. Start by roasting the walnuts and almonds on a hot frying pan for a few minutes. After the roasting chopped the nuts roughly. 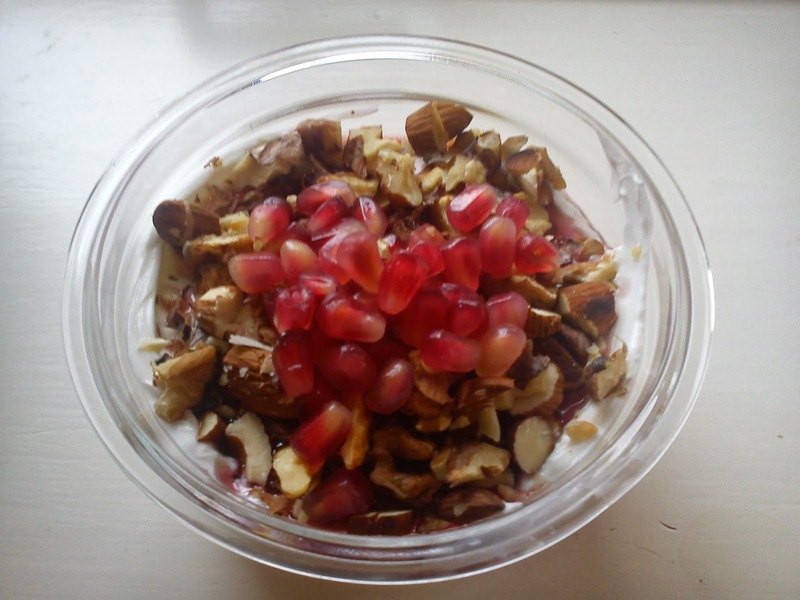 Fill the pomegranate syrup on top of the yogurt followed by chopped and roasted walnuts and almonds. 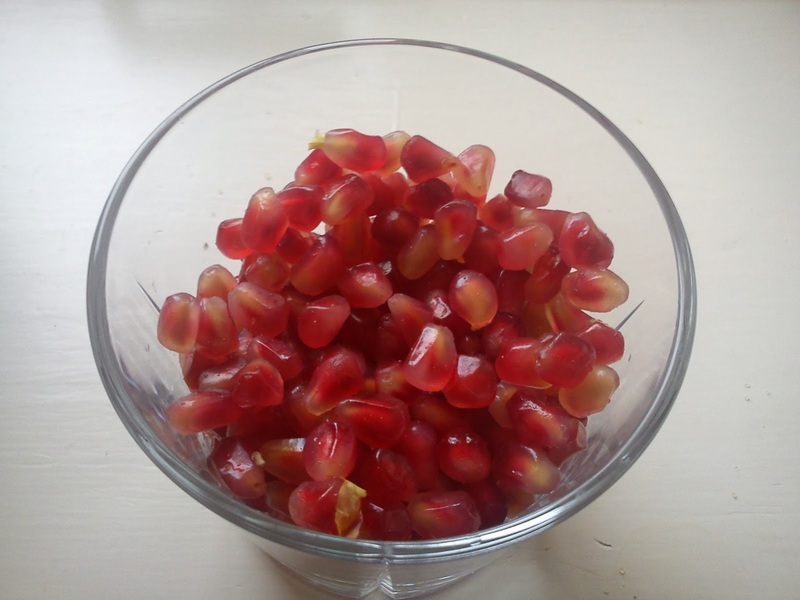 Finish off with some pomegranate kernels as topping - perhaps in the shape of a heart ? Are you my Valentine tomorrow ? Tomorrow it is Valentine Day, so perhaps you would like to make something special for your very own Valentine ? I have the following suggestions, if you were my Valentine ? 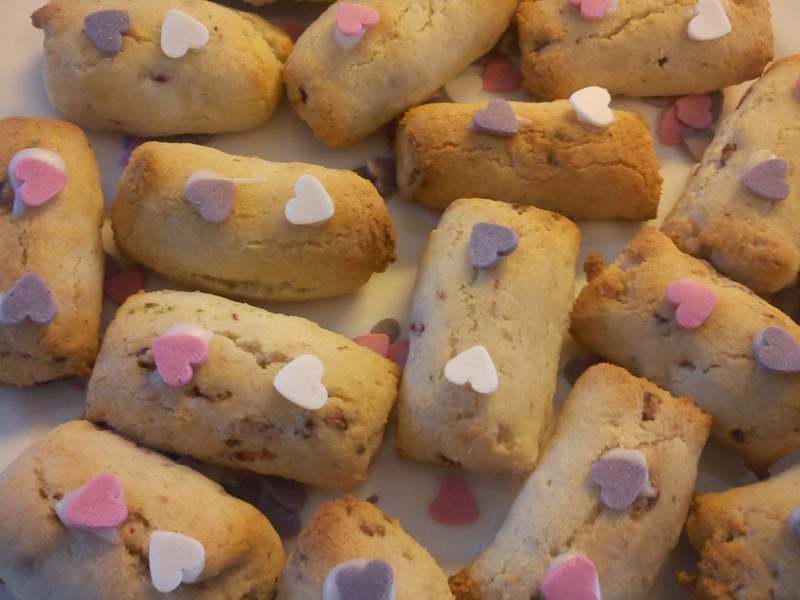 Valentine cookies with pomegranate kernels, white chocolate and rose extract. LOVE cupcakes full of yet some more amazing Amarena Fabbri cheeries. My Valentine cocktail is sparkling tasty combination of rose extract, Cointreau, cranberry juice and sparkling wine for you celebrate your love with. 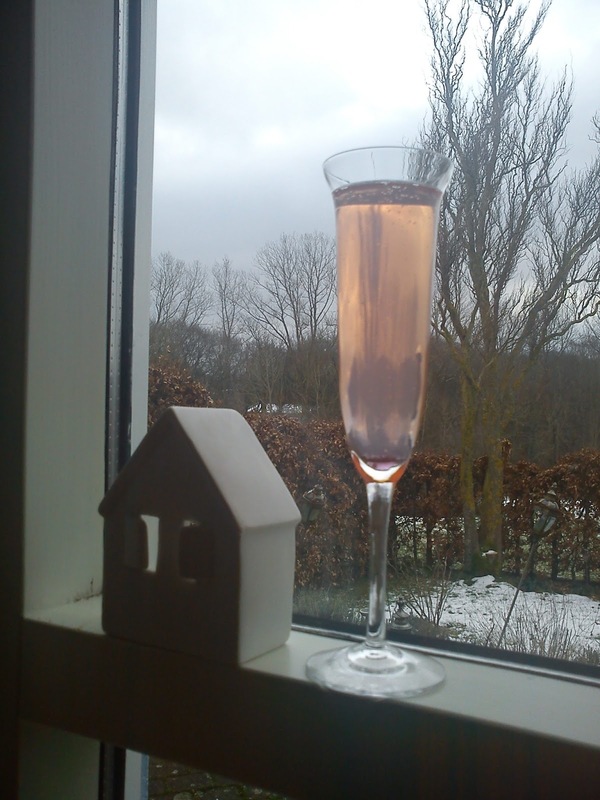 And as final suggestion thisValentine sparkling cocktail being sparkling wine with rose extract. It is can be very easy and tempting to eat at the hotel, when you are travelling and it is -15'C outside and snow everywhere. But sometimes you are better off putting on your polar outfit and get outside to find a restaurant in the neighbourhood. Well, I did the first part during a recent business trip to Helsinki = eating at the hotel !!! 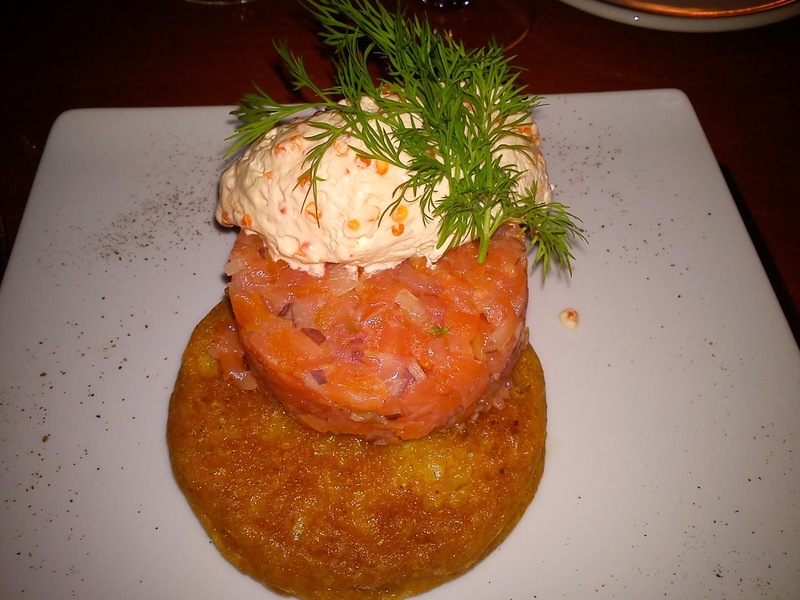 As starter I was served blinis with salmon and sour cream. I could not complain about the size of the starter, however I would have preferred the blinis to be thinner instead of being the size of Camembert size !!! 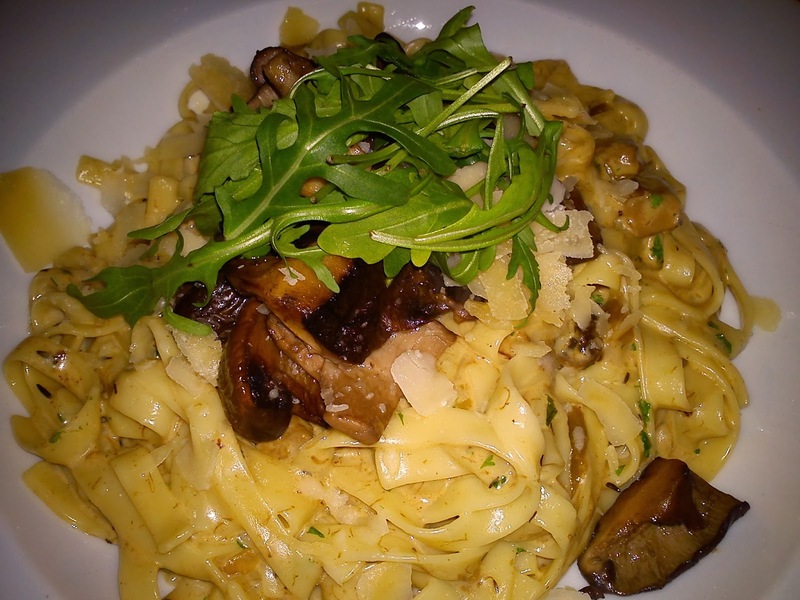 As main course I had selected pasta with mushrooms, which was another big size portion being to fatty for my preference. 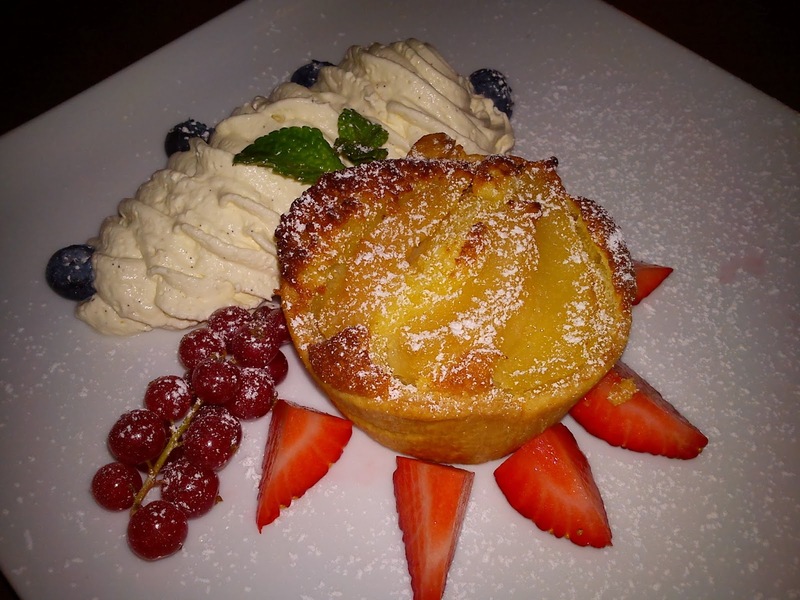 The best part of the meal turned to be the dessert, where I had selected pear pie with marzipan having a more appealing look being served together with fresh fruit. I ended to with paying approx 45 € for the food, 1 glass of white wine and 1 cup tea. I will give this meal 2 stars, as I think the overall quality in form of taste and texture has plenty of room for improvement. No complaints on the serving sizes, which easily could feed two persons. It is high season for pomegranates, which is so fully of taste, bursting texture, vitamin C and some active ingredients being of great benefit for your facial look, as they perhaps will remove your wrinkles !!! Divide the pomegranate into 4 pieces. Remove the kernels. Do this over a cooking pot, so you do not waste the wonderful juice of pomegranate. Add lemon juice, water and sugar to the pomegranate kernels in the cooking pot. Let it boil for approx 10 minutes, while stirring regular. Pass the pomegranate syrup through a sieve and collect the syrup. Store the syrup in the refrigerator. I will not mentioned any names, but some people have been asking me, if I am going "ottomok" !!!! 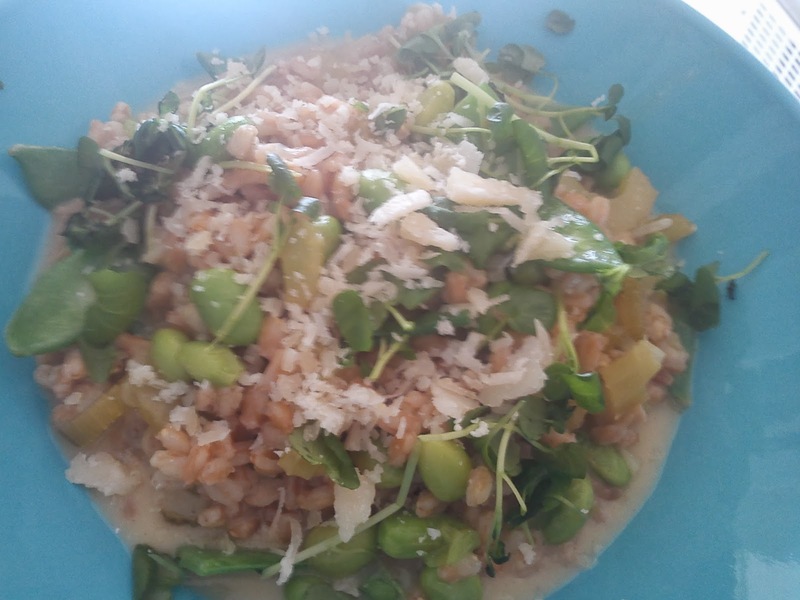 Perhaps because I have been sharing four recipes on risottos and speltotto with you over the last 3½ weeks. 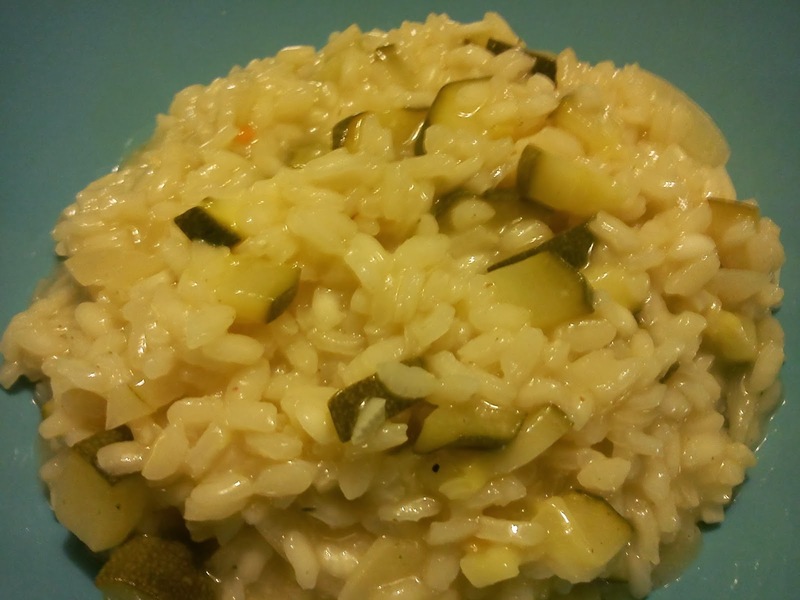 Well here is another recipe on risotto, which arrived together with my weekly vegetable box this week (newsletter 6/2014). And as it gave me the chance to use the squash in risotto, I knew at once I had to make yet another risotto. I have made a few adjustments on the amount of rice and vegetable stock. Chopped all the vegetable in the desired size. Heat up the olive oil in a bigger cooking pot. Add all the vegetable and fry them for 2-3 minutes. Add the risotto rice and stir them around for 1 minute to absorb the oil. Pour in the white wine on top of the vegetable and rice and let the wine cook at lower heat, until the majority of the wine has boiled away. Afterwards add the warm vegetable stock little by little, let the rice absorb most of the liquid, before adding more vegetable stock. This part of the cooking process takes approx. 20 minutes.Keep stirring regular. Add the smaller butter pieces and let them melt into the risotto together with the grated Parmesan cheese. Serve the risotto with grated Parmesan in the serving plates/bowls. Eat together with the white wine. 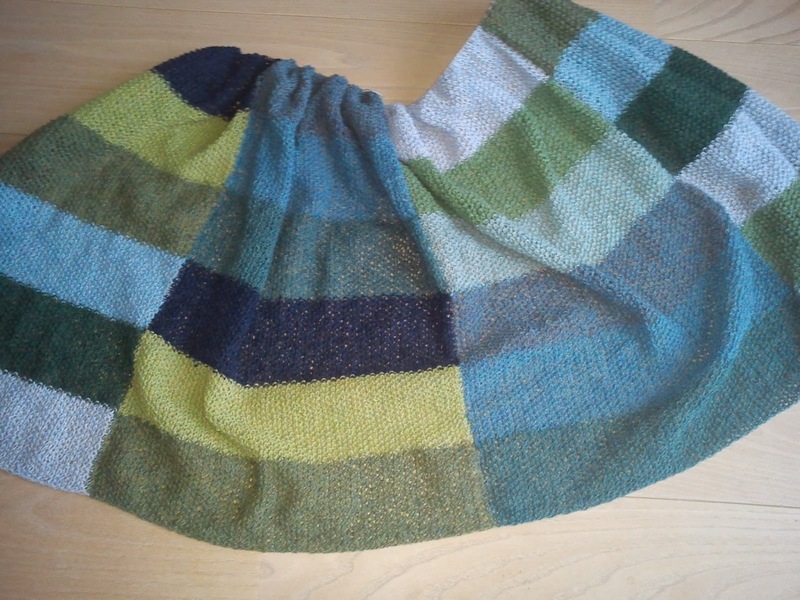 It is 3 weeks ago, that I shared my first progress after 1 week of knitting, how it is was going on my knitting of a plaid in wool with you. 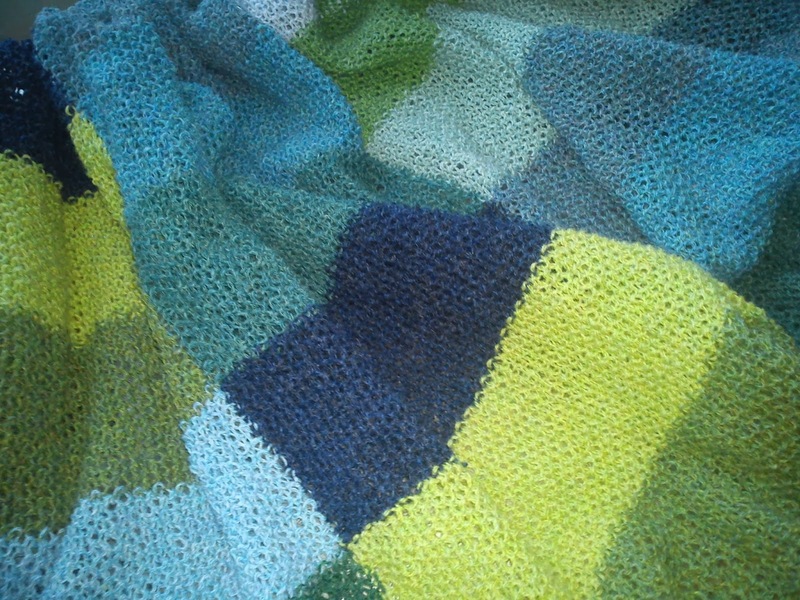 After 4 weeks of knitting I have managed to six colour rows out of the entire 17 colour rows, so I definitely progressing having finished more than 1/3 !!! I adore blood orange for it´s vibrant colour and it´s orange taste with that extra flavour twist. And when I am in Germany shopping I always buy juice of 100% blood orange to take home with me, as we here in Denmark "only" can get a mixture of orange juice and blood orange juice. 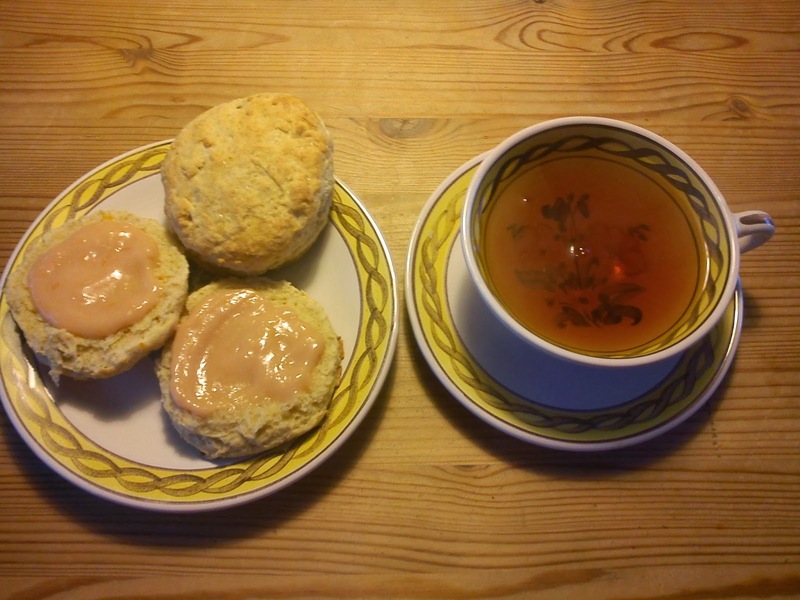 So when I saw a blog posting on blood orange curd by Cookies, cakes and bakes on the Tea Time Treats January 2014, I knew at once, that I NEEDED to make some blood orange curd using this recipe on lemon curd as starting point with some adjustments. As blood oranges continue to be in season I playing with the idea of making some blood orange jam. If you have an excellent recipe on blood orange jam, please feel free to share it with me ? Start by adding boiling water to the storage containers/glasses. 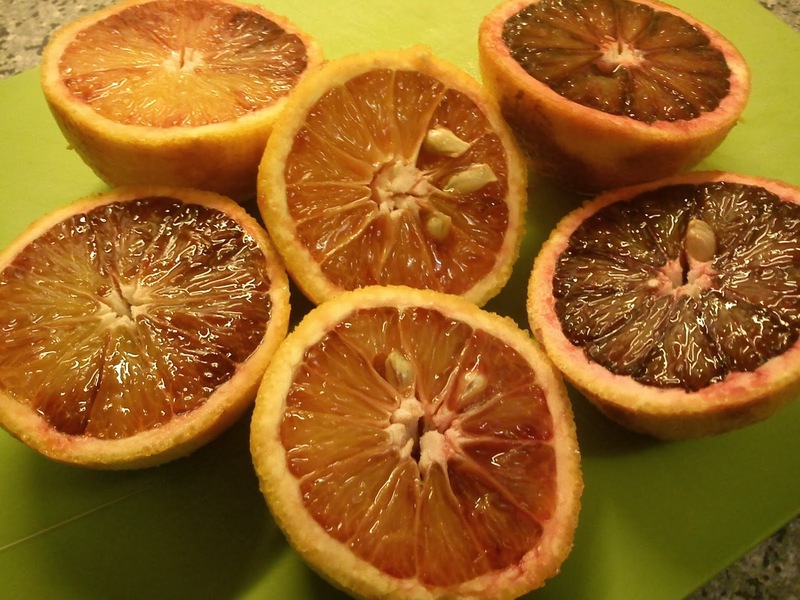 Take the zest from the blood oranges as well as squeeze the blood oranges for their juice. Whip eggs and sugar together in a bowl, before pouring this mass into a small cooking pot. Afterwards add in the blood orange zest and juice. Heat on the blood orange curd mass on low heat, stir very well in the mass, heat the mass until it thickens. The blood orange curd must not boil. If you want a more redish colour add in some red food colour. Add into lemon juice, if you would like a twist in form of freshness and more fruitness. Add in the lemon juice little by little, stir very weel after each addition and taste and make up your mind, if more lemon juice would be a benefit for the overall taste. Remove the cooking pot form the heat and stir in the butter and let it melt. Pour the blood orange curd into the prepared containers/glass and place them in the refrigerator. In case you add no preservation to the blood orange curd, the shelf-life of it is approx. 1 week, when stored cold in the refrigerator. Travelling on regular basis in Finland in the cold Winter months of January and February I have noticing as well as tasting a very Finnish cake called Runeberg's torte described on Wikipedia. 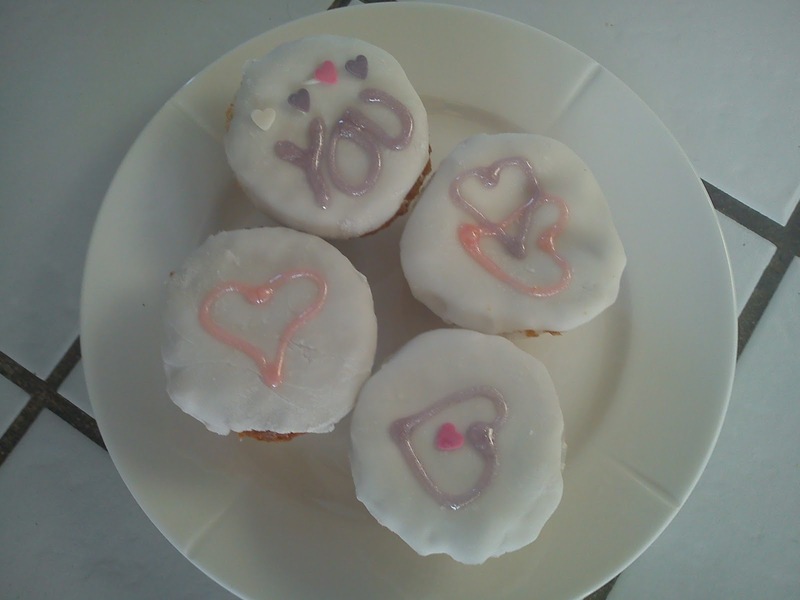 It is a cake in sort of a muffin shape decorated with raspberry jam and white icing sugar on the top. The flavour inside the cake is dominated by cardamon and some sort of alcohol, very tasteful combination. This cake is named after Johan Ludvig Runeberg, which was eating this cake for breakfast !!! Today (5 February) it is the birthday of Runeberg, so I have decided I should try to bake my version of this cake, which I have been enjoying for more than 10 years travelling in Finland. So I have spend some time locating a recipe on this Runeberg´s torte on Goggle, using Goggle Translate for the translation part from Finnish into Danish. I decided to try out this recipe on Runebergin tortut by Kinuskikissa. In order to have less top on the muffin I reduced the amount of baking powder to 50% as well as place the muffins in the lower part of the oven during baking. The muffin top was reduced, nut I still had to cut off the top of the muffin, so the upside of the muffin became the downside of the Runeberg´s torte. It is quiet a messy cake to make due to the high fat content and the dipping process of cake in a sugar-alcohol syrup after the baking process. 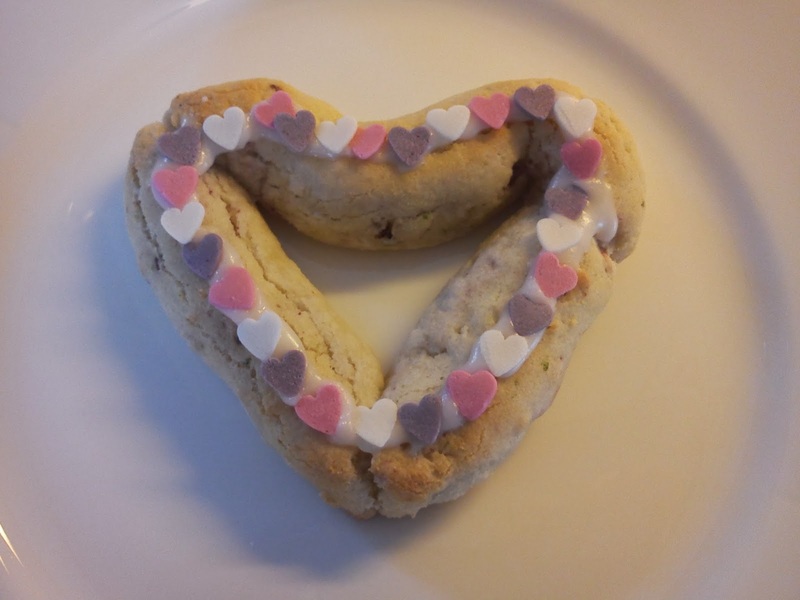 So I have already decided to make my own Danish version in 2015 !!! Hopefully being respectful enough of the Finns and their cake. Mix blended honey cake together with flour, almond flour, baking powder, cardamon and vanilla sugar. Whip the butter and sugar together in a fluffy white mass using an electrical mixer. I normally whip for 5 minutes. Whip in the egg, one by one, without whipping to much. Shift from electrical mixer to mixing gentle by hand in order not to over whip the cake mix. Alternating stir in whipping cream and flour mix into the cake mix. Fill the cake mix into muffin forms. Bake the muffins in the middle/lower part of the oven at 200'C for 30-35 minutes. Before removing the muffin check, that the muffin is baked using a cake tester. 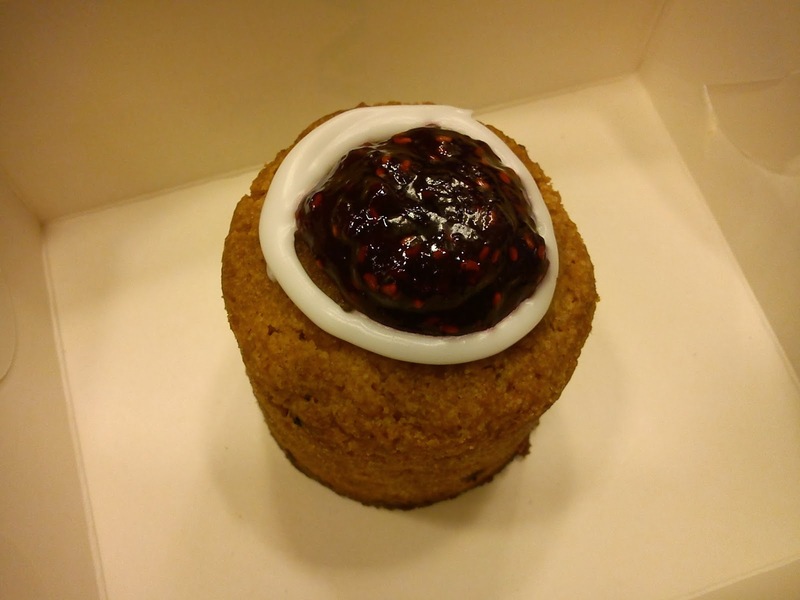 Cut off the muffin top using a knife, the upside of the muffin is now the downside of the Runeberg´s torte. Heat up the water and sugar in a small cooking pot, until the sugar is dissolved. Cool down this sugar syrup and add the cardamon liqueur in. Dip the muffin into this sugar-alcohol syrup, so all of the muffin is soaked. 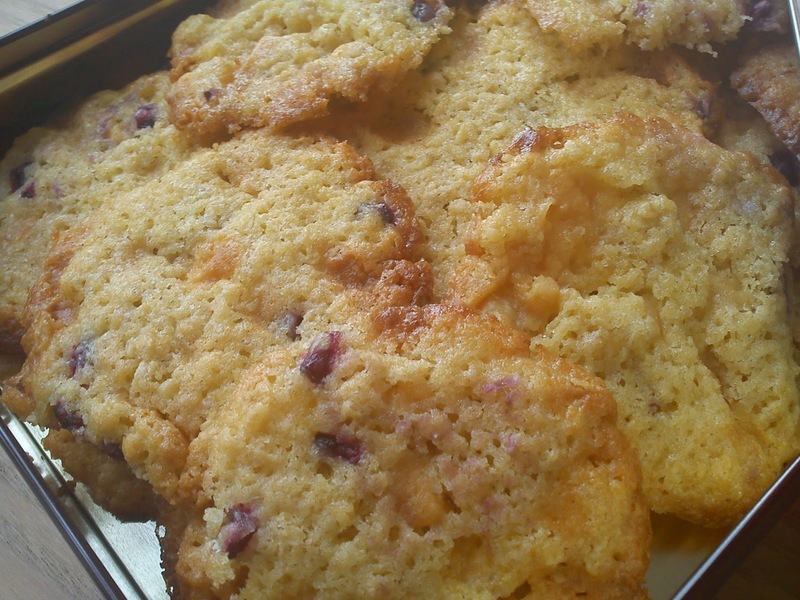 Remove the muffin from the sugar-alcohol syrup. 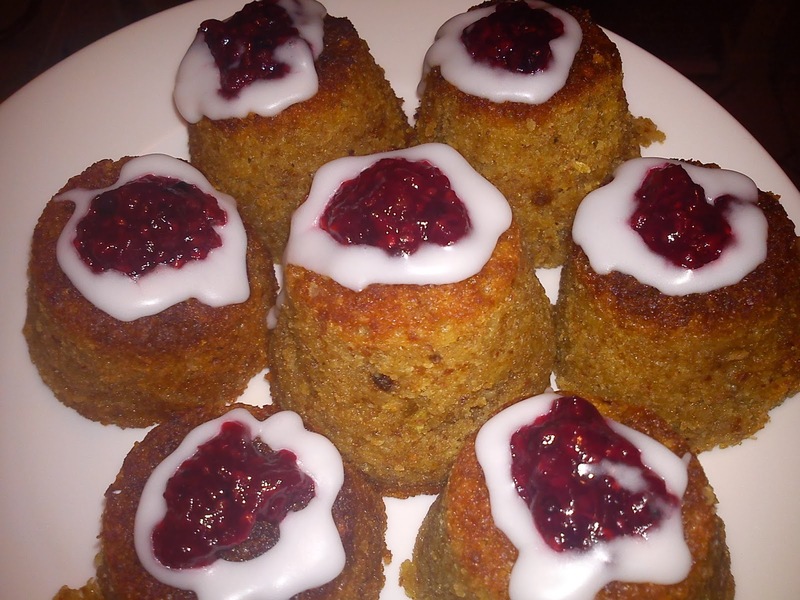 Decorate the Runeberg´s torte with raspberry jam with a ring of icing sugar around the jam. As you know, I am huge fan of risotto, so when I saw this recipe on speltotto with Edam beans in the weekly magazine "Alt for Damerne", issue unknown from 2013, I knew at once, that I wanted to test it out in my little kitchen working with something than the usual rice grains. addition of sugar peas, as I had a rest of this in my refrigerator, which needed to be used for something than cabbage. If you make a bigger portion it is important, that you first added the water cress on the part of speltotto, which you will be eating that particular day, as fresh water cress can contain earth bacteria, which is unwanted in food, which will be cooled down and reheated later on. Add the spelt grains and stir them around for 1 minute to absorb the oil. Pour in the white wine on top of the vegetable and spelt grains and let the wine cook at lower heat, until the majority of the wine has boiled away. Afterwards add the warm vegetable stock little by little, let the spelt grains absorb most of the liquid, before adding more vegetable stock. This part of the cooking process takes approx. 20-25 minutes. Keep stirring regular. Add the smaller butter pieces and let them melt into the speltotto. Add approx 40 g of the grated Parmesan cheese and stir well. Top of the speltotto top with the rest of the grated Parmesan and chopped parsley on the serving plates/bowls. Enjoy together with a glass of white wine. Why do I call February the romantic Winter month ? Well in the middle of February Valentine´s Day is located !!! Valentine´s Day is not a big event here in Denmark, besides from the flower shops trying to make an event of the day in the hope, that they will sell more flowers. For me Valentine´s Day is providing me with a theme, which can work as inspiration for various sweet thing to test out in my little kitchen. And I will already now promise you, that I have several ideas floating around in my head, so you have something to look forward with regards to blog posting midway through the last Winter month. Well my focus for January was to share recipes on stews and casseroles with you !! Did I succeed with this ? Well if you can call risottos for casseroles, I have been doing pretty good sharing 6 various comforting meals with you, and they have help me to keep warm during a Winter becoming more and more cold due to strong wind and low temperatures.